Commercial real estate services and investment firm, CBRE, have announced in their latest Prime Rent and Yield Monitor, that UK prime commercial property rental values saw an increase of 0.7% in Q2 2018. However, at the All Property level they revealed that prime yields were fairly flat, rising by only one basis point (0.01%) to 5.3% over the quarter. They believe the outperformance of the industrial sector boosted these results in both prime rents and yields. As a result, Q2 was the seventh consecutive quarter of industrial outperformance. 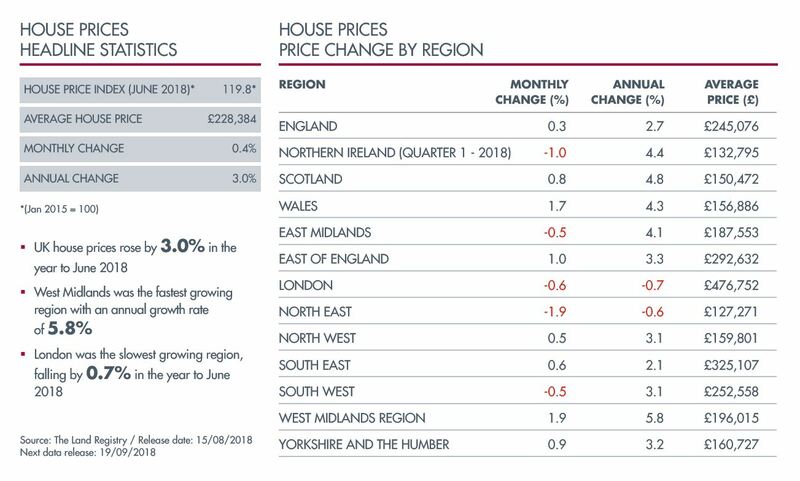 Prime rental values increased 2.1% in the quarter, following the 2.3% increase recorded in Q1 2018. Regionally, prime North West industrials outpaced all other submarkets, recording an increase in rental values of 5.9%, which represents the highest increase in the region since 1990. In Q2, High Street Shop prime rents decreased -0.5%, the biggest quarterly fall for the sector since Q3 2012. Most regions recorded falls in prime rents, with the largest recorded in Wales (-2.6%) and South West (-2.5%). Head of UK Research at CBRE, Miles Gibson, commented: “All Property results continue to demonstrate the resilience of prime commercial property, although performance continues to be boosted by the Industrial sector“. Commencing in April 2019, UK commercial property held offshore will be subject to Capital Gains Tax when it is sold. So, commercial property held in trust in jurisdictions such as the Isle of Man, Guernsey and Jersey will be brought into line with those currently held on the UK mainland. Catax, a specialist tax relief company, has reported commercial property owners could be forced to pay in excess of £8.6bn if they fail to revalue properties in advance of the tax change. It is therefore advisable for offshore commercial property to be urgently revalued to reflect their current value, prior to this date, to minimise any future liability to tax. The Chief Executive of Catax, Mark Tighe, was reported as saying: “Although April may seem like some way away, the reality is that commercial property owners are going to be stung quite badly if they don’t act quickly. Whether it’s an office building in the Gherkin, a hotel in Manchester or even a dockyard in Dartford, property values have only been going one way. The cost of not acting could be catastrophic for these offshore trusts. It is so simple to revalue a property and can often be done in conjunction with a Capital Allowances survey, which could see an immediate financial benefit to property owners“. The UK’s retail warehouse commercial property sector continues to do well. Savills have reported that this sector has seen the fastest growth than any other commercial property market over the last thirty years with annual returns of 11.5% since 1980. They went on to add that over the last 37 years, rental growth in retail warehousing averaged 4.3% and suggested that there is “very little evidence” supporting the theory that online retail enjoys better profitability than ‘bricks-and-mortar’ retailers. Much of this upbeat analysis can be attributed to the fact that large scale retail parks have proliferated across the UK in recent years, despite initial concerns that online retail would succeed in undercutting demand for physical retail outlets. Extra delivery prices for online shopping has helped to push customer appetite back towards larger scale shop alternatives.